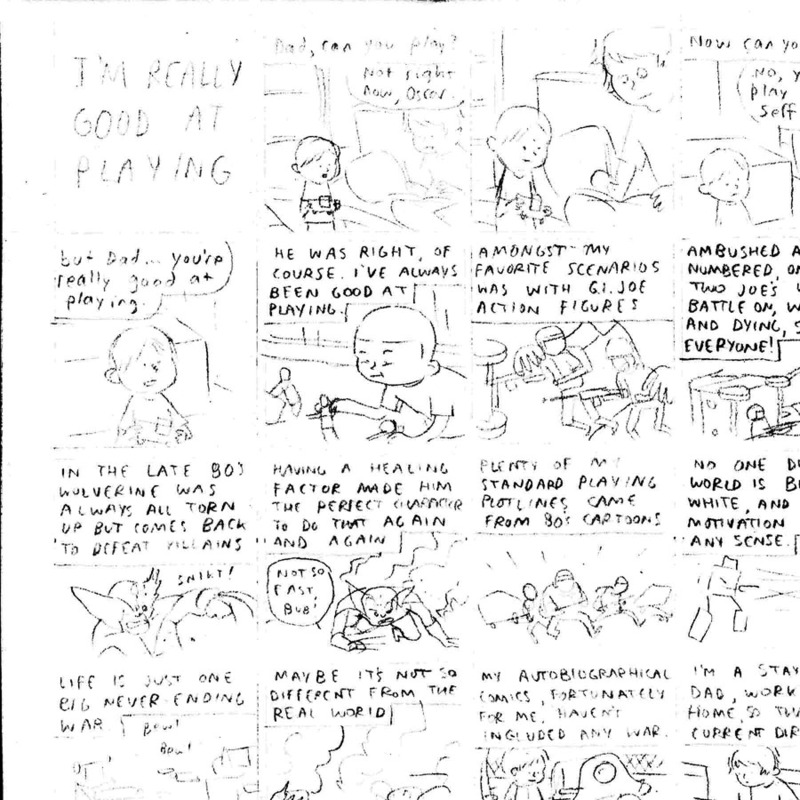 I was going to write an essay over at GraphicNYC, but realized what I was trying to say worked much better as a comic, and they just posted I'm Really Good At Playing today. 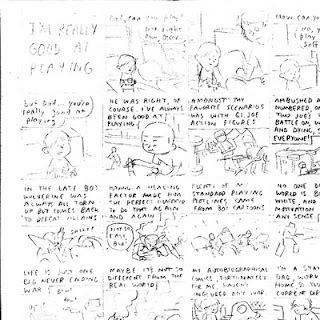 Here's a step by step look at the process once I'd scrapped the idea of writing it as a prose essay. First I made a small outline, and expanded that out into a full script. I was basin the dimensions on he biggest size my scanner bed can handle. 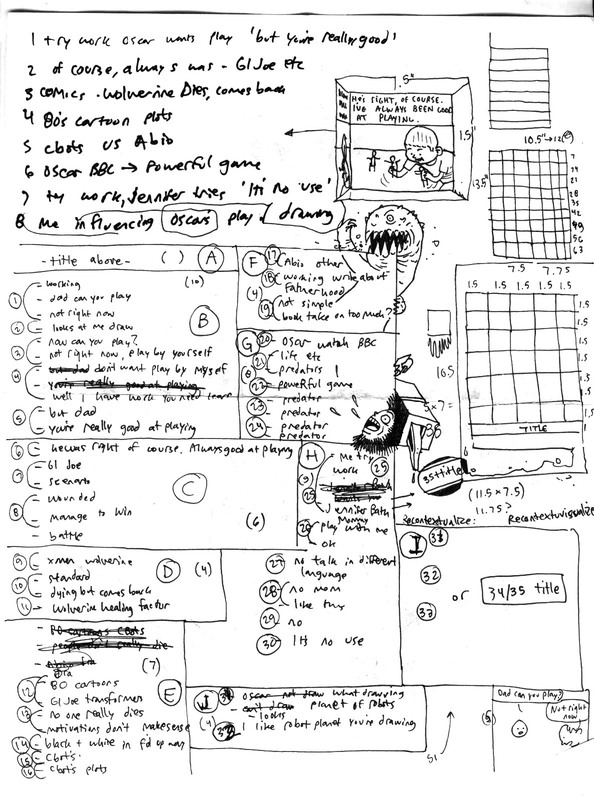 I streamlined the script and wrote it out on the back of the illustration board I was drawing the piece on, so that if I was working out at the coffee shop I didn't have to carry the extra piece of paper with me. Because an extra piece of paper can be very heavy. I was planning on making the comic full color, so I pencilled the piece out a bit more completely than I might normally. 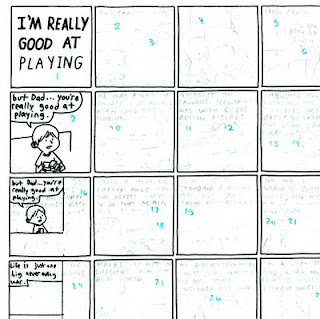 I started to ink and immediately screwed up the first panel - the title - and decided to start over. I tested inks and sizes a little bit on the illustration board first. 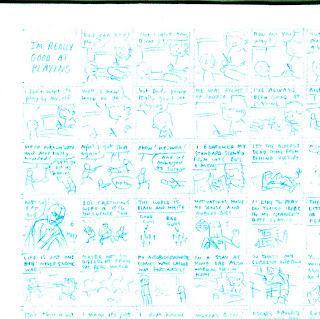 So then I re-pencilled the story in non-photo blue, intending to draw it only as black and white line art. 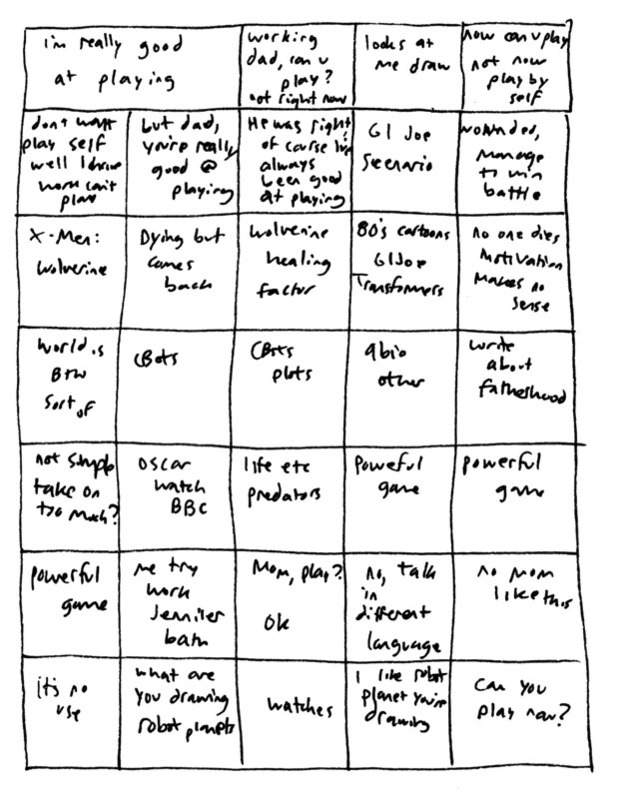 I also made the panels smaller and split things up, nearly doubling the number of panels. Head over to GraphicNYC to see the whole, complete comic. 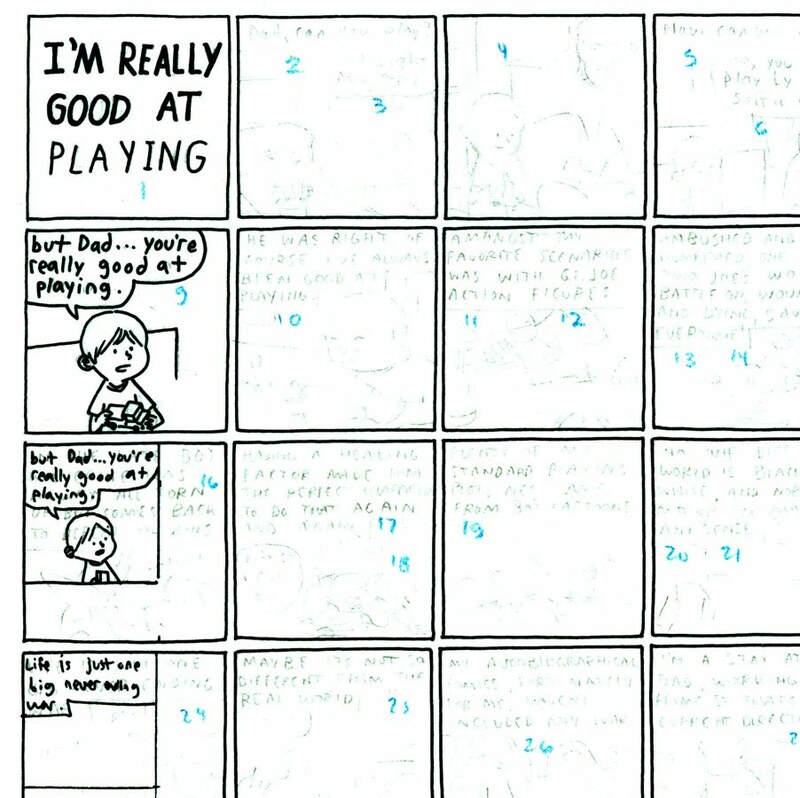 At the Chicago Zinefest this past Saturday, I held a one hour minicomic challenge. 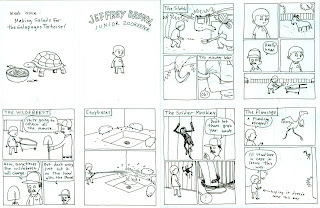 The idea was that in the hour I had, I would come up with the idea for the comic, write it, draw it, and make copies that I would fold and staple and give to everyone there. I called it a challenge because I wasn't sure I could do it, especially since I was also going to be talking to the audience about my process as I worked and answer questions. 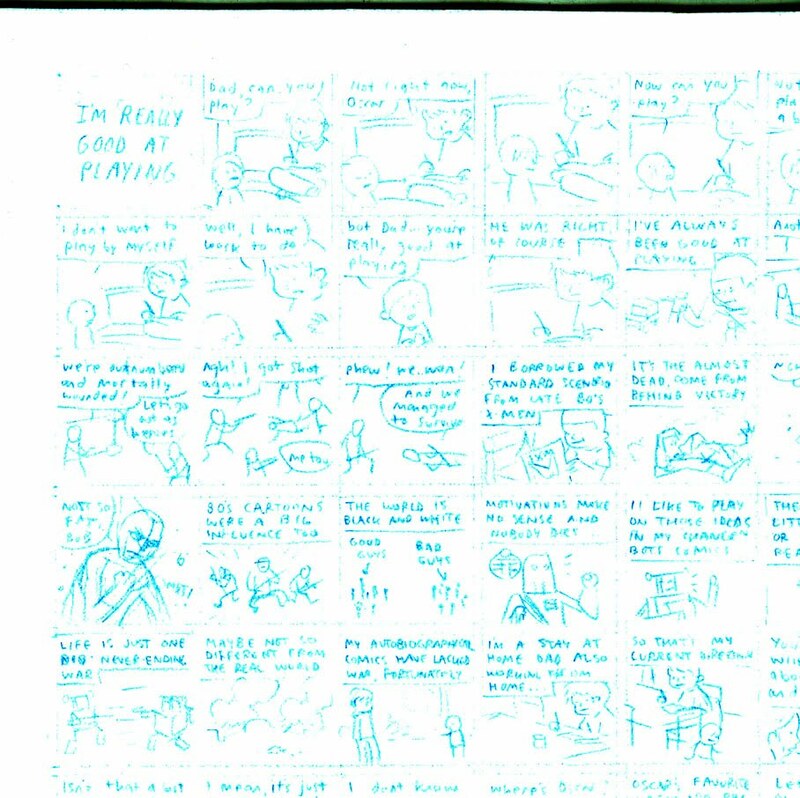 I had already quartered and numbered the pages in non-photo blue pencil to save a little bit of time. 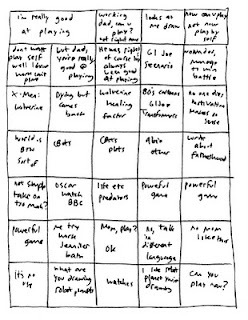 First thing was to have them throw out suggestions of what the comic should be about. 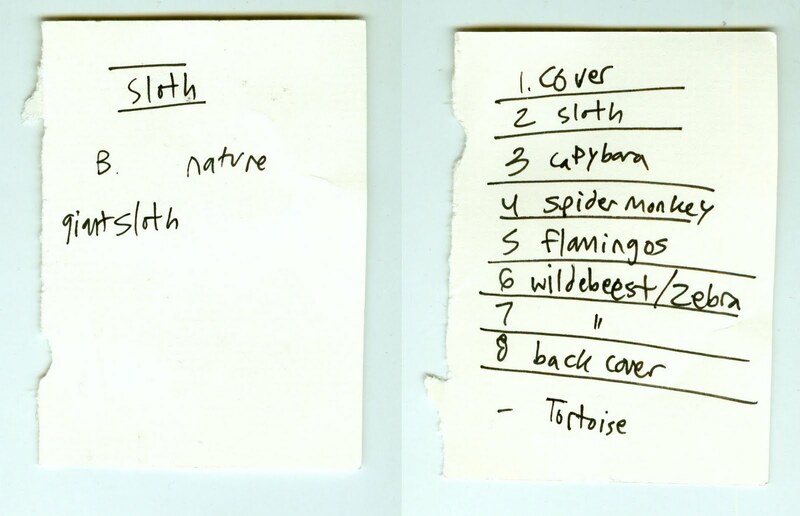 The first idea thrown out was sloth, and after a few more ideas were suggested I decided I'd go with sloth, making the snap decision to not waste time. 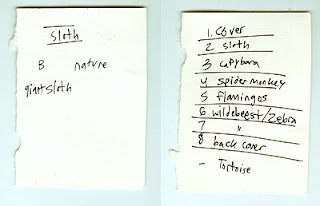 My first thought was about the giant sloth skeleton at the field museum, and then I remembered in sixth grade when I got to be a junior zookeeper for a week, and one day got to go into the sloth exhibit. 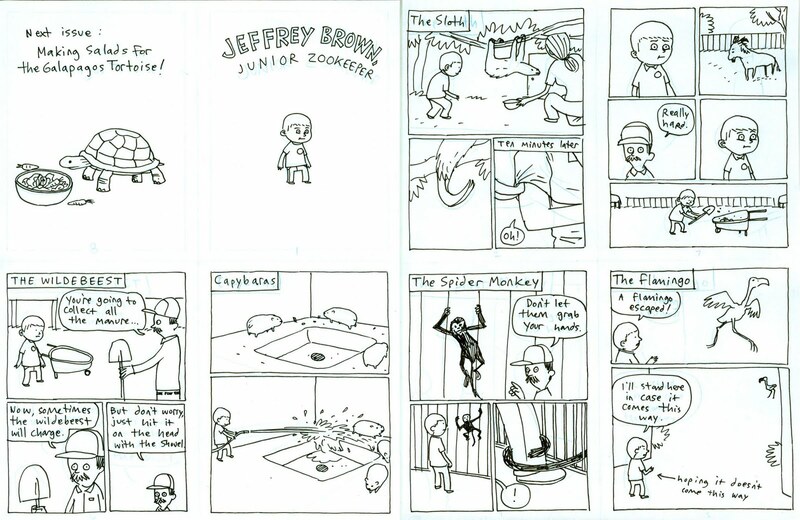 So I brainstormed another handful of stories from that week as a junior zookeeper to fill up the minicomic, since all that happened with the sloth was that he hooked his claw onto the zookeeper's shirt. I guess I could've just made that one story 8 pages and just have the sloth move really slow, but that would be kind of boring and felt like a cheap trick. Anyway, I managed to draw the comic in the hour, just finishing the last page as time ran out. The Zinefest took the pages and ran off to make copies, while everyone who had attended wrote their names down so they could pick a copy up from me later, after I'd folded and stapled them at my table. There were over fifty people there, and I feel like it was pretty successful. I don't know if it'd have been harder or easier to just make up a fictional/fantasy sloth comic, but it worked out well to make this one autobiographical. Incidentally, there were three people who didn't pick up their copies, so they can email me to see about getting their copy. It's a busy couple days starting tomorrow. Close on the heels of my interview at Gaper's Block, I'll be on air for Tony Breed's morning radio show on CHIRP between 8 and 9 am central. 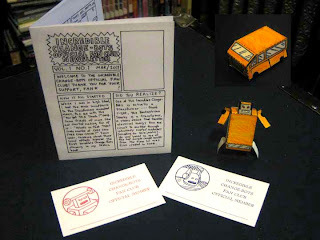 This is all in advance of this weekend's Chicago Zinefest. Tomorrow night I'll be reading at 826CHI as part of the exhibitor readings sometime between 630 and 830. 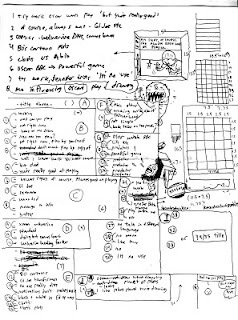 And then in addition to having copies of Process and Oscarfor sale at my table on Saturday, I'll be doing a special workshop: The One Hour Minicomic Challenge, where I'll attempt to complete an 8 page mini from idea to printed/folded/stapled in one hour, while I answer questions and talk to the attendees. 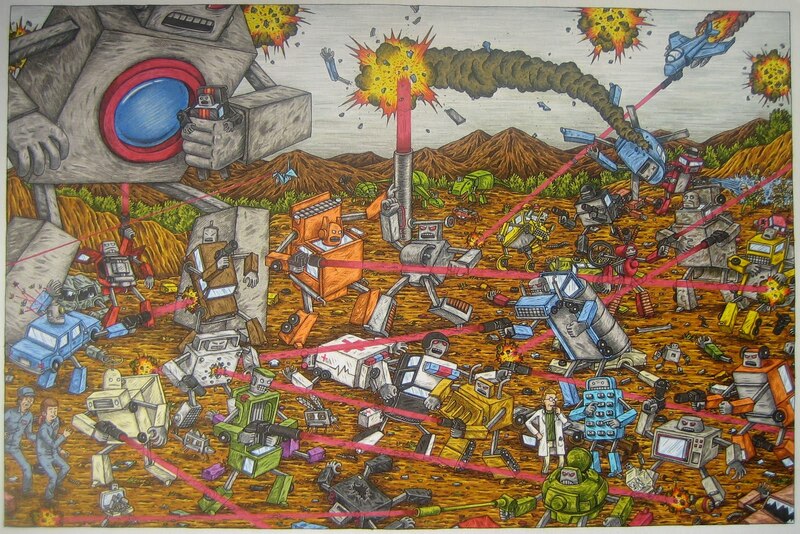 This weekend I'll be at McCormick Place for C2E2, where Top Shelf (booth #810) will debut Incredible Change-Bots Two. I recently finished "Bew! Bew! Bew! ", the 15"x21"(apx.) 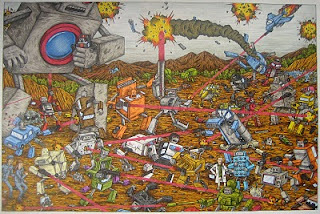 Change-Bots battle drawing I've been working on for the Change-Bots Two art show at Scott Eder Gallery in May, so stop by Scott's booth (#728) to check it out (as well as a spectacular collection of other artists' work). I'll also have a few copies of the letterpress Oscar minicomic, some of which was on display at the MCA Chicago's "New Chicago Comics" exhibition earlier this year, as well as Change-Bots Fan Club Memberships, the Process minicomic, and hand-drawn trading cards. If you're in San Francisco instead of Chicago, head over to Giant Robot for their Game Over 4 art show to see my Balls Patrol. Incredible Change-Bots Two will be out sometime in the next month, along with the first volume coming back into print. There's a new Change-Bots Fan Club offer - the new offer doesn't include the fancy drawing the original offer did, but it's also cheaper. 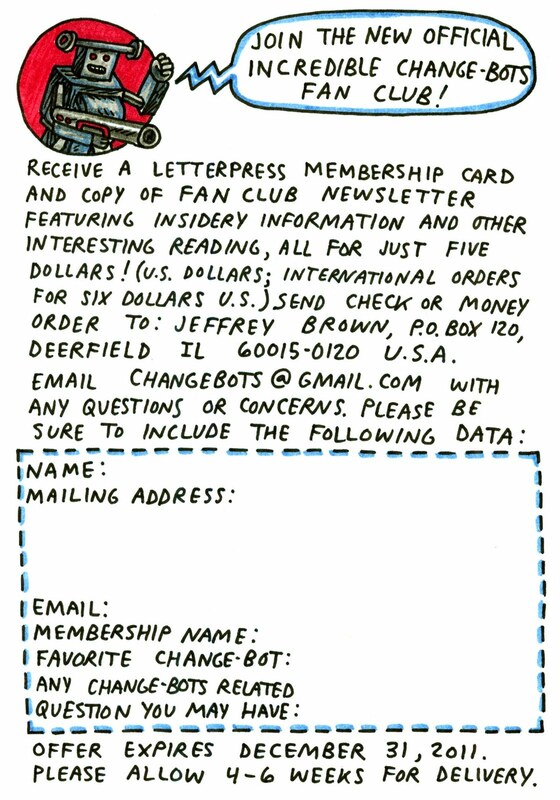 You get a hand letter pressed membership card (your choice of faction), and the current month's four page newsletter which includes fun facts, a comic strip interview with a Change-Bot, a one page comic, a bonus fun page, and a small drawing of your favorite Change-Bot. There'll be a different newsletter for each month while the offer is available (until the end of 2011). The first newsletter's bonus page is a cutout pattern to make your own paper Rusty. I colored and assembled one to show how it looks - he even does a low tech incredible-change. Details on how to join below; I'll also have limited quantities on hand at conventions and signings. Paypal is also now accepted - paypal to the same email listed on the form. Please note to clarify - the membership includes the current newsletter only; I may try to have some email version of the whole set available to send out at the end of the offer, but costs are prohibitive for sending out physical copies every month. I drew the film poster (colored by Bill Crabtree) for the adaptation of Tao Lin's novel Shoplifting From American Apparel, and Sangha Films has a Kickstarter page up now to fund the film. Incentives include a chapbook that will have art from myself and others. Watch the trailer to see the talking trees I also drew. P.O. Box 120 Deerfield IL 60015-0120 USA jeffreybrownrq is my hotmail email.